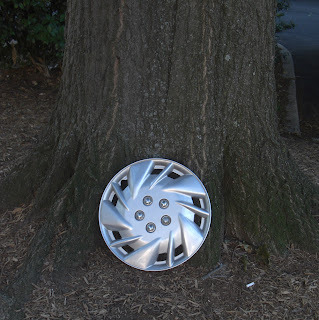 Ode Street Tribune: did you lose a hubcap? did you lose a hubcap? If you were recently driving by the majestic Westmoreland Terrace Condominiums on historic Ft. Myer Drive, are you missing a hubcap? If so, this hubcap might be yours. It appears to belong to a Toyota Corola. The hubcap has been saved at the base of a large tree in front of Westmoreland.